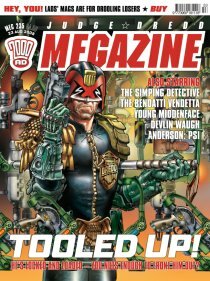 The Judge Dredd Megazine Odyssey: Meg 235 - Tooled Up! A fabulous Cliff Robinson cover - I could tell it was his artwork straight away. A classic Dredd. Speaking of Dredd, we had ourselves a long single story by Rennie and Holden called The Magnificent Umbersons. Poor old Cousin Herb is sick of being the family idiot and so takes his revenge on the rest of the high-flying Unberson clan. Great story, great art - which is pretty much the default behaviour for the dream team of Rennie and Holden. Still not 100% on Shaun Thomas' art in the latest Young Middenface. Having got used to Ridgeway and Goddard/Teague (who's styles are quite similar), it is a little jarring. But it's not too distracting from the central story, which is continuing to build nicely. This is a real gem from Alan Grant, and perhaps should have been the template for Anderson. I think Middenface has benefited from having regular breaks, whereas scheduling Anderson one after another seems a real slog... Lots of action in this episode as the muties take on the norms and Kreelers to avoid being taken into slavery. The Bendatti Vendetta continues to build nicely, as our two heroes take the fight to the Camorras by disrupting a number of their key operations. Lovely stuff from Morrison and Burns again, and I'm really looking forward to seeing how this plays out. The episode finished on a bit of a cliff hanger. Is it all part of the plan, or are the Bendatti avengers in over their heads... Ooo - it's tense! Part 5 of All Hell, the Devlin Waugh adventure, sees us continue to journey deeper into Hell - or the oriental version of hell that is. Devlin has teamed up with an old acquaintance who hastens their journey, but is it all too little too late? Some lovely art on display, some of MacNeils best for me, and I'm really into this story. There is plenty going on, lots of eastern philosophy, religion and myth and some strong characters. And I know who everyone is! Hurrah! In the reprints, Charley's War continues to be awesome - so glad it's back - as Charley and his friends do everything they can to clear the Silvertown ammunition factories before the German Zeppelins arrive. Honestly, if there's a better war story out there - I'd like to read it! The Metro Dredd was pretty awful. I'll say no more! In my last article, I bemoaned the fact that there hadn't been a fiction text story. Well, guess what? Yep - a Dredd fiction story made an appearance! Honestly, I don't read ahead on BARNEY to see whats coming up - I'm genuinely writing this like I'm reading the Megs from back in the day. I don't want to spoil any surprises. So I was pretty pleased to see a this back! The Robbie Morrison Interogation continued to be of interest. I haven't read Nikolai Dante, and was a bit worried it would go on a lot about that story, but actually Robbie did a lot of different and interesting stuff during this period, including publishing a graphic novel of his own. I'll confess to not reading any of the Heatseekers articles this time round. They just didn't rouse my interest. Check BARNEY if you want more info. The Dredd Files. Oh dear oh dear. When will it end?! And finally...you could win a Star Trek toaster! OK, I'm about 8 years too late, but the fact a Star Trek toaster exists is really quite funny!